Hello! 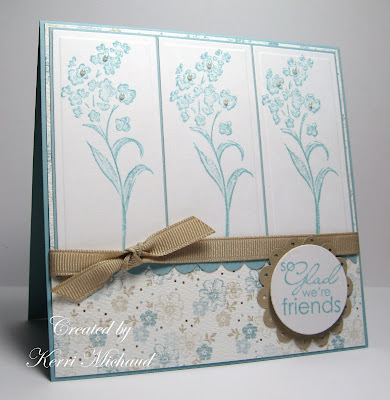 This week's featured stamper on SCS is Kelly H! She has a beautiful gallery which you can check out here. I chose to CASE this beautiful card. I used my free stamp set I picked out when I signed up to become a SU demo~Wonderful Watercolors. It's such a pretty set, and I know I'll be able to do use it a lot of different ways! I also used my Stamp-a-ma-jig for the first time! I don't know why I was so intimidated by that thing~it's actually very easy! Anyway, I stamped the images with Baja Breeze and cut them out with my Long Rectangle, Nestabilities. I added a few pearls to the centers of the flowers. The dp is my new favorite in the SU cattie~Parisian Breeze Specialty DSP. The sentiment comes from the retired hostess set~Best Yet. I stamped the sentiment with Baja Breeze and cut the circle out with my Nesties. I punched the Scalloped Circle out of Kraft cs and punched the little holes with a 1/16" punch. The ribbon is Oatmeal Offray ribbon which matches the Kraft perfectly! Thank you so much for stopping by today! Thanks for stopping by my blog and for the kind comment! I just came to see yours and it's awesome!!! This card is beautiful! I love this dp too... I just got mine and haven't cut into it yet but it's gorgeous! Love your free set too! Great card and great case. I didn't play today... rarely get to play the Featured Stamper challenge due to time crunches on Sun. but they are a favorite of mine! Back to check out more cards... just wanted to say thanks for stopping and see ya soon! Kerri, I just love this!!!! It is so beautifully elegant!!! Lovely card!!!! Oh this is sooooo sweet...it's like peacefukl...soothing....just really lovely and beige can be so boring but this is really nicely done, girl.